Ah, Disney's Hollywood Studios. My favorite park as a kid. This park is in the midst of its biggest expansion in history, and over the last year has seen a number of closures of classic attractions. 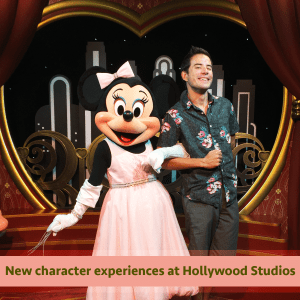 However, the park has added some very special character meet and greets to their lineup, and I'm here to give you the information on each one! Frozen Fever may have subsided a bit since the film's debut, but fans have still been wondering when the film's snuggle little snow star would get his own meet and greet area at Walt Disney World, and now the wait is finally over! Olaf has found a new summer home right across from Star Tours (between the restrooms and the ABC Studio currently showing Star Wars: Path of the Jedi). Currently, this meet is available all day from park open to park close. Currently, the waiting area to meet this guy leaves a little to be desired aesthetically as parts of the queue are located both indoors and outdoors. The meet location is being referred to as the Celebrity Spotlight, which leads me to believe that we will see other characters of current Disney films available to meet in the future. BUT, when you get into the room where Olaf has set up his summer home, it's completely adorable (and it smells like COCONUTS!). Wait times for Olaf in his first week have ranged from 30 minutes to being able to just walk right into the room to see him. My recommendation would be to see him earlier in the day (before noon), or closer to park closing time. Just around the corner near the ABC Commissary (right across from the Sci Fi Dine In), Mickey and Minnie have invited you to join them in set for their newest films! The waiting area for these two mice appears to be much more dedicated to theming at the moment, as the hallways in the indoor portion of the queue feature some very amusing posters of films the two have been working on. Minnie is the first of the two you see, and she's decked out to the nines in a new pink dress, in a very impressive setting. I had a few jokes about Minnie's dress upon seeing pictures before this area opened (Molly Ringwald's prom disaster in Pretty in Pink came to mind!) but in person she looks adorable. After meeting Minnie, you'll head down a hallway to see the Big Cheese himself in what I have to say is the COOLEST meet and greet room ever! It was so exciting to see Sorcerer Mickey receive such an amazing backdrop for interactions and photos after he's spent the last few months being shuffled all over the Studios. He was more than happy to show me a few of the spells he's been working on (as long as I promised not to tell Yensid, haha). Red Carpet Dreams opens at park opening time and typically closes about 30 minutes before the park closes for the night. This is another one I recommend getting to in the morning shortly after park open for shortest wait times. If you love these mice, you are NOT going to want to miss seeing these two! With Minnie being busy over with Mickey getting ready for their new films, someone has to take care of Mickey Mouse Clubhouse in the Disney Junior courtyard (to the right of The Great Movie Ride). Pluto has decided to take up residence there! Personally, I LOVE this new area for Pluto. His energy and spirit work so well with all the vibrant colors of the meeting area, and in my opinion, it makes for much better pictures than his spot in Town Square at Magic Kingdom or his plain spot in Epcot. The playful puppy can be found with the rest of the Disney Junior stars from 30 minutes after park open to 6:30 p.m. The waits for this area stay at about 15-20 minutes all day, so make sure you give Pluto a visit any time before he goes to bed for the night! With all the changes coming to Hollywood Studios in the future, it's great to see Disney adding fun experiences like these while we wait out the clock for Toy Story Land and the Star Wars Experience. I hope you make the time on your next Hollywood Studios visit to check out these new spaces! Did you know? Level 2 WDW Prep Members have character times and locations available as they build their touring plans. Is the Mickey meet and greet still there in 2017? We plan on going in December! We’re planning for an upcoming trip and I’m noticing that Olaf, Mickey and Minnie, Woody and Buzz Lightyear are all now special ticketed events, 7:45a – 9a, before park opening and only on Saturdays. When did that happen? Does anyone know if this is a permanent change? No prices are listed for the event. My daughter and I went to DLR in 2015 and the wait time for Olaf was INSANE. I’m glad to see this is easier. My kids are anxiously waiting to meet Olaf. We are looking forward to these experiences. Thanks Character Queen!